Today, I am going to pull a classic first line from a classic book, and to do so, we're digging deeper into history than we ever have for First Line Friday . 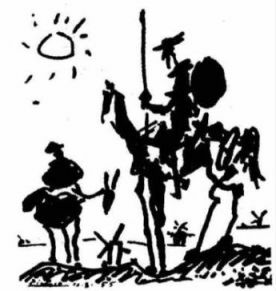 . . clear back to 1605 and Miguel De Cervantes' novel Don Quixote De La Mancha. "En un lugar de la Mancha, de cuyo nombre no quiero acordarme, no ha mucho tiempo que vivia un hidalgo do los de lanza en astillero, adarga antigua, rocin flaco y galgo corredor." "Domiciled in a village of La Mancha, the name of which I purposefully omit, there lived, not long ago, one of those gentlemen who usually keep a lance upon a rack, an old target, a lean horse, and a greyhound for coursing." To me, the Spanish version is far superior to any English version which I have found. The English versions seem burdened and lacking in flow. But even in English, I have an affinity toward this first line that has survived centuries. "At a village of La Mancha, whose name I do not wish to remember, there lived a little while ago one of those gentlemen who are wont to keep a lance in the rack, an old buckler, a lean horse and a swift greyhound." Either way I think it's a decent opening. Yes, it's basically just "There was once a man in a nameless village" but then he adds those intriguing details that tell you this is no ordinary man. Certainly good enough for 1605, but I also think it still works today.